And as the years progress, R.E.M. 's Document turns 25, which means it's been the end of the world as we know it for that long. Bad joke? Yeah, but that doesn't mean it isn't true. My only real sore spot with this album is their cover of Wire's "Strange." Ever hear it? Listen below. I reviewed the band's 25th Anniversary Edition of Fables of the Reconstruction in 2010 and Lifes Rich Pageant in 2011. All info comes courtesy of EMI. R.E.M.’S DOCUMENT REMASTERED AND EXPANDED FOR 25TH ANNIVERSARY EDITION, TO BE RELEASED SEPTEMBER 25 BY CAPITOL/I.R.S. Hollywood, California – August 7, 2012 – R.E.M. has teamed with Capitol/I.R.S. for the September 25 release of an expanded 25th Anniversary Edition of the band’s 1987 album, Document. The new edition features the digitally remastered original album, plus a previously unreleased 1987 concert from R.E.M.’s “Work” tour. The commemorative release also adds new liner notes by journalist David Daley, with the 2CD package presented in a lift-top box with four postcards. On the same date, the remastered original album will be reissued by Mobile Fidelity on 180-gram vinyl in faithfully replicated LP packaging. 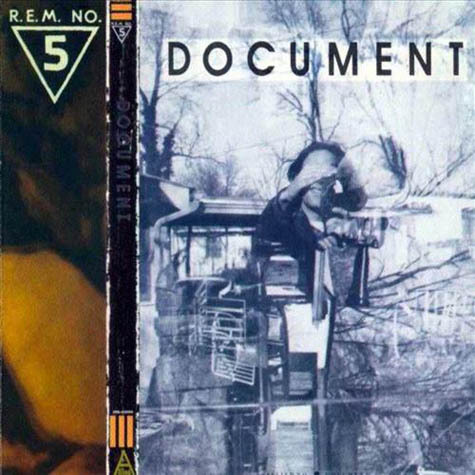 R.E.M.’s fifth studio album, Document was recorded by vocalist Michael Stipe, guitarist Peter Buck, bassist Mike Mills, and drummer Bill Berry at Nashville’s Sound Emporium. The first of several R.E.M. albums to be co-produced by the band and Scott Litt, Document was also the band’s first to go Platinum and includes the singles “Finest Worksong,” “Its The End Of The World As We Know It (And I Feel Fine),” and “The One I Love,” R.E.M.’s first Top 10 on the Billboard Hot 100. The album peaked at Number 10 in the U.S., spending 33 weeks on Billboard’s Top 200. In his 1987 review of the album, Rolling Stone’s David Fricke described Document as “the fifth in a series of singular state-of-our-union addresses by America’s most successful fringe band.” Indeed, Document launches with a call-to-action, as Stipe sings, “The time to rise / Has been engaged” in “Finest Worksong,” bearing witness to history-repeating-itself tactics employed by the country’s elected leaders, evidenced by the Iran-contra hearings, Star Wars missile defense saber-rattling, and a hyper-moralized Congress bent on restricting and regulating controversial language in the arts. R.E.M. had released four albums in the previous four years, each selling more than the last. With the release of Document, the band found itself at a crossroads of sorts – all but ignored by conservative rock radio and MTV, yet reaching a broad and devoted international audience, sprung from independent media and college radio. Listen to Peter Buck’s 1987 introduction to Document, recorded for attendees of that year’s New Music Seminar, here. As the band’s upward trajectory continued, improbably sandwiching “The One I Love” between Whitney Houston’s “So Emotional” and Jody Watley’s “Don’t You Want Me” on the U.S. singles chart the same week Rolling Stone’s cover hailed R.E.M. as “America’s best rock & roll band” (read Rolling Stone’s 1987 R.E.M. cover story here), they launched their “Work” tour in Europe. The concert included in Document’s new edition, recorded live in Utrecht, Holland, reveals a band poised to take over the world.Document’s 25th Anniversary Edition follows the special edition releases of R.E.M.’s four other I.R.S. albums, including Murmur and Reckoning, released by UMe/I.R.S., and Fables of the Reconstruction and Lifes Rich Pageant, released by Capitol/I.R.S. Audio and video anthologies of the legendary band’s 1980s I.R.S. Records output, And I Feel Fine... The Best Of The I.R.S. Years 1982-1987 and When The Light Is Mine… The Best Of The I.R.S. Years 1982-1987 Video Collection, respectively, were released by Capitol/I.R.S. in 2006.